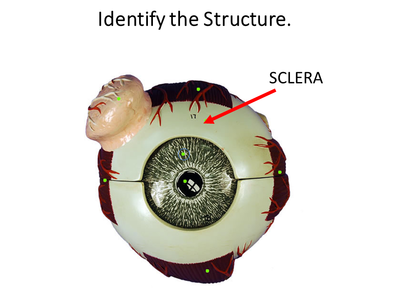 ​ The sclera is the white protective outer layer of connective tissue that surrounds most of the eye (or globe). It functions to provide structure and protection to the eye and to act as an attachment for muscles of the eye. 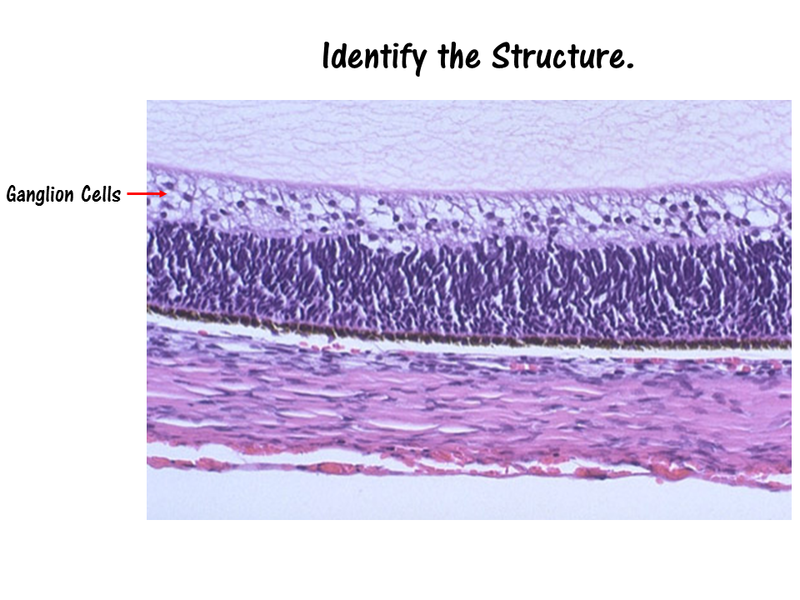 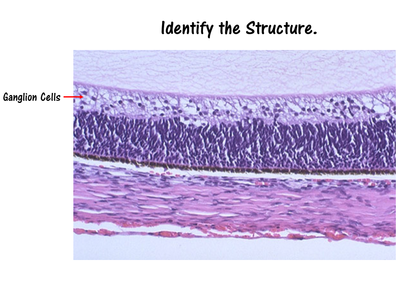 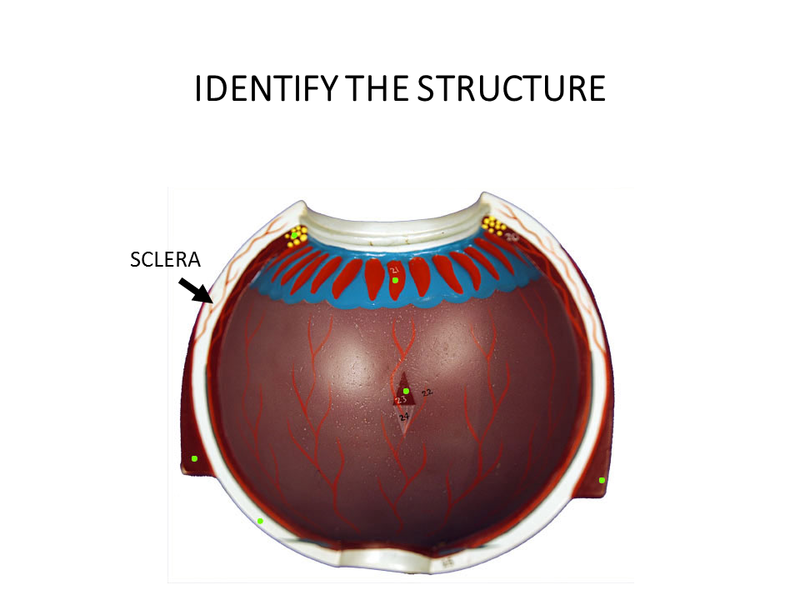 The sclera is made of a fibrous connective tissue that has collagen and elastin fibers. 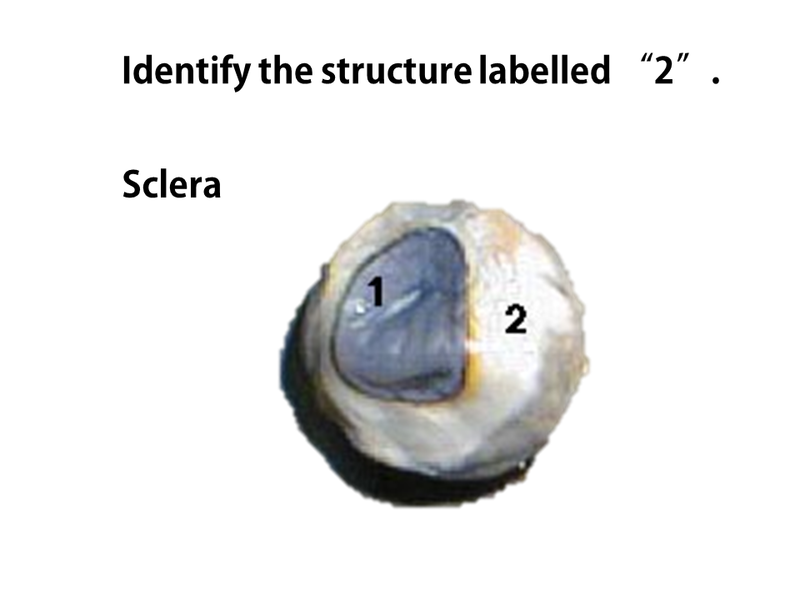 The sclera forms the posterior part of the globe and it continuous with the dura mater and the cornea. 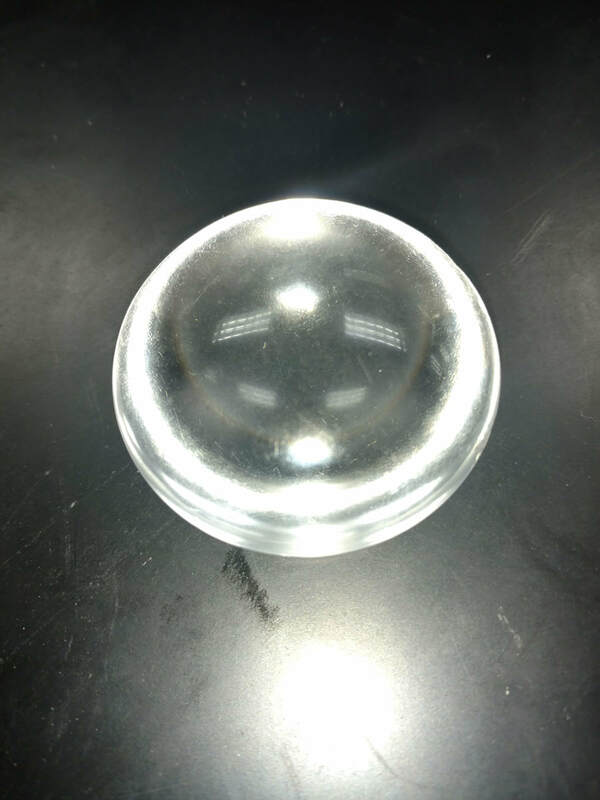 The sclera functions to provide protection, provides the physical structure that give shape to the globe and acts as a surface for muscle attachment. The pupil is the dark circular part of the eye that functions to allow light to come into the eye. The pupil is actually not black at all. In fact, it is a hole in your eye. 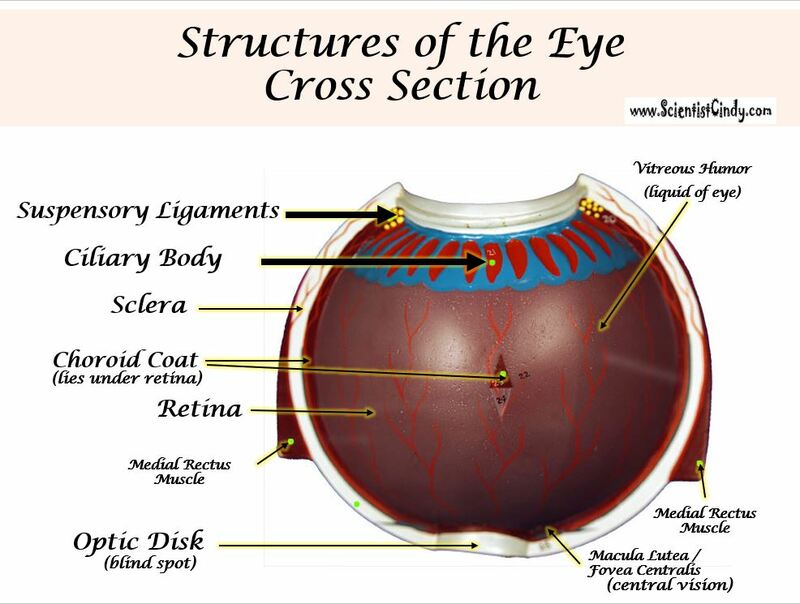 When your doctor looks into your eye either an ophthalmoscope, they are looking through your pupil and examining your retina at the back of your eye. The word 'lacrimal' comes from the Latin word 'lacrima' which means "tear". Our tears function to clean and lubricate the eyes. Tears also form in response to irritation, strong emotion and yawning. 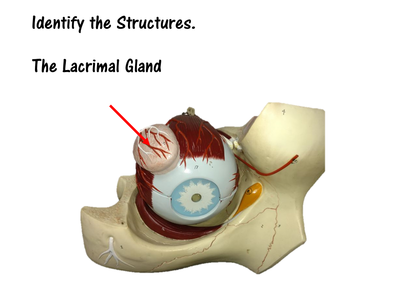 The lacrimal glands are located at the upper lateral region of each orbit. The lacrimal gland produces tears which then flow into canals that connect to the tear duct and drain into the nose. ​The cornea is the clear anterior portion of the eye that is continuous with the sclera. 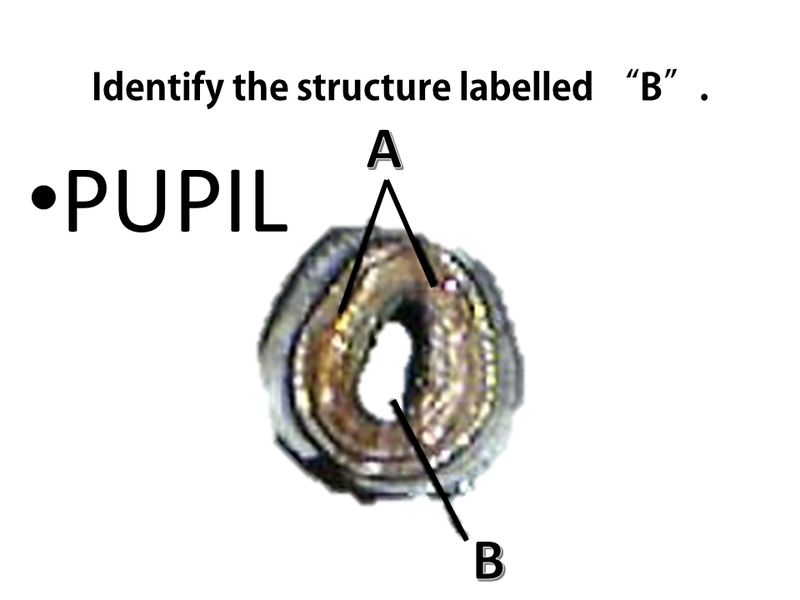 It covers the lens and the pupil. The cornea and lens function to refracts light, to focus the image on the retina at the back of the eye. While the cornea contributes most of the eye's focusing power, it does not have the ability to change shape, so its focusing power is 'fixed'. 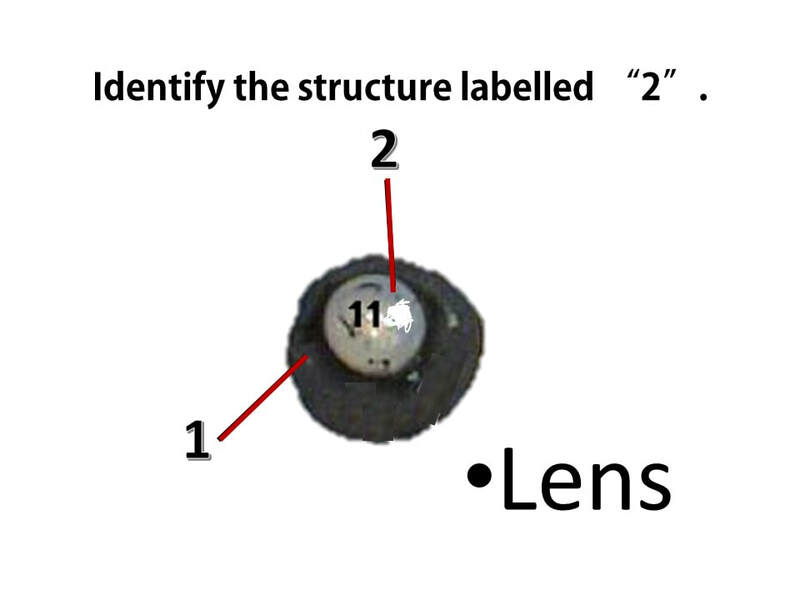 This means that only images that are at a certain distance will be in focus. For this reason, the cornea functions along with the lens to accommodate images at different distances. ​The lens and the cornea function together to refract light onto the retina, thereby focusing the image on the retina. 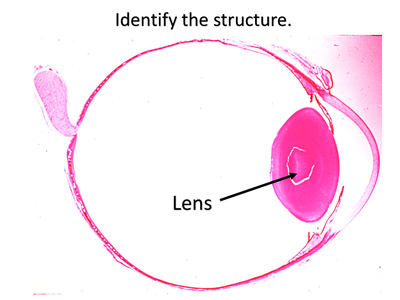 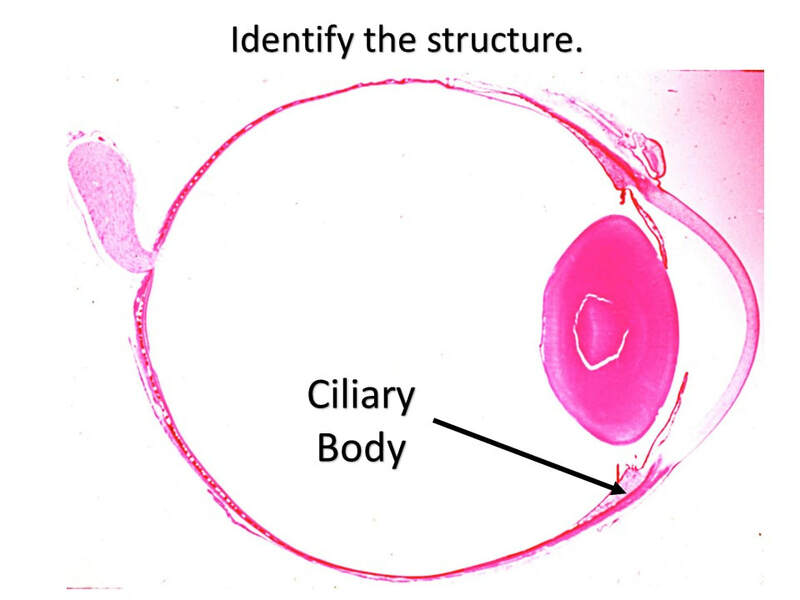 ​The ciliary body has ciliary muscles that control the shape of the lens. 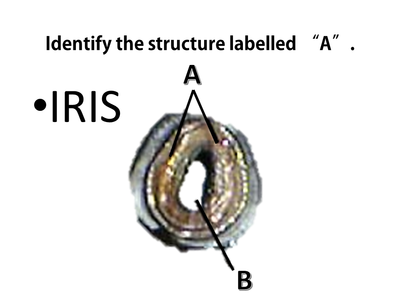 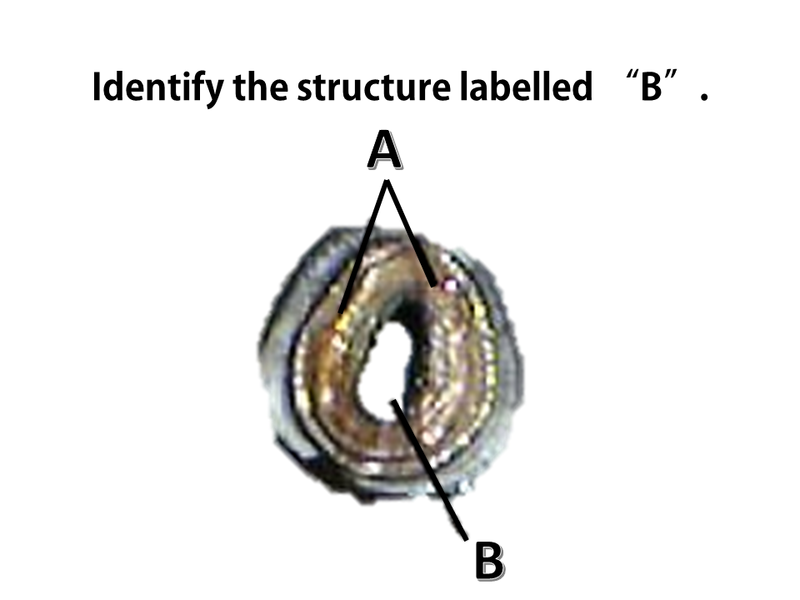 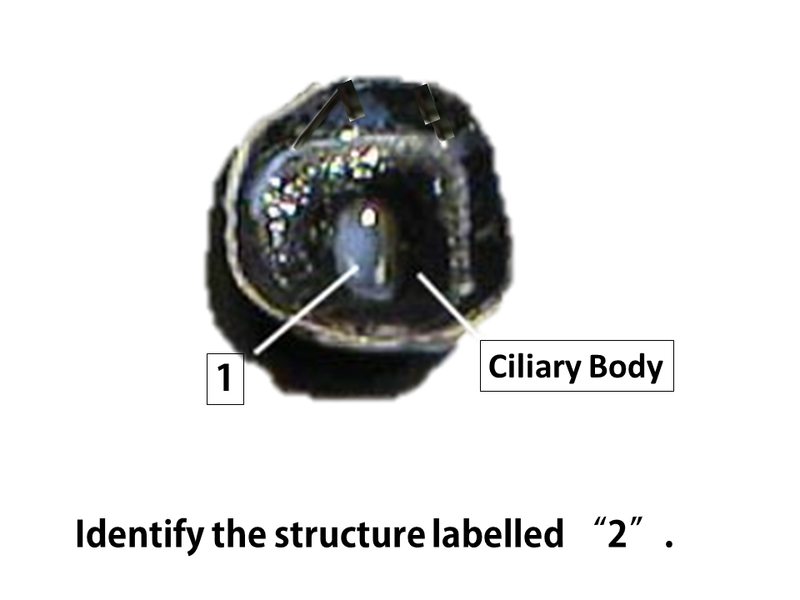 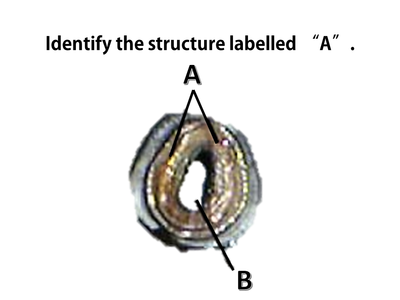 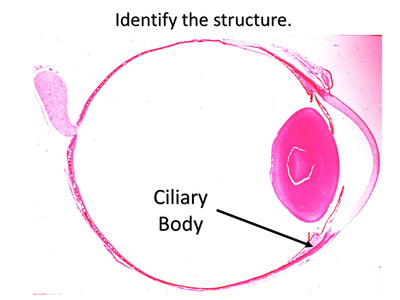 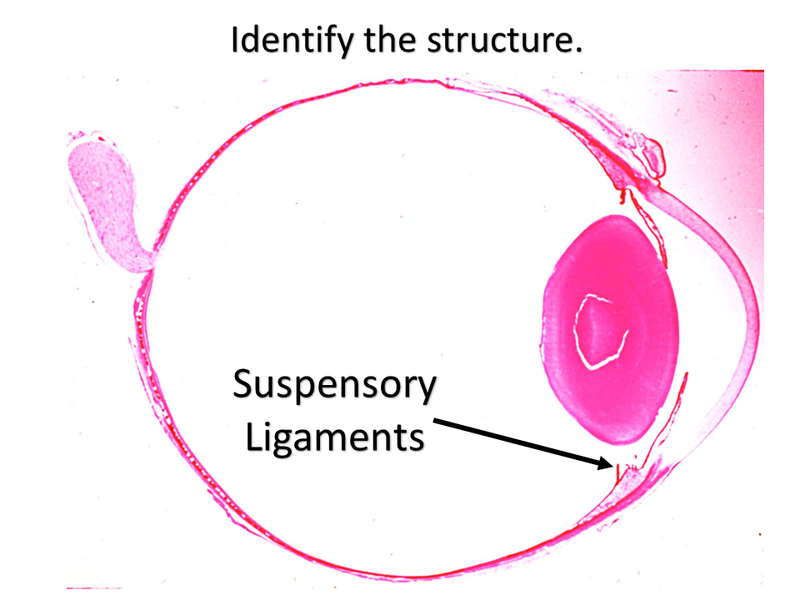 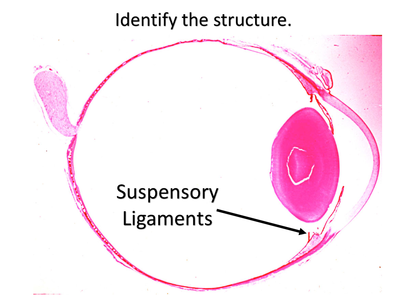 The ciliary body is connected to the lens by suspensory ligaments. 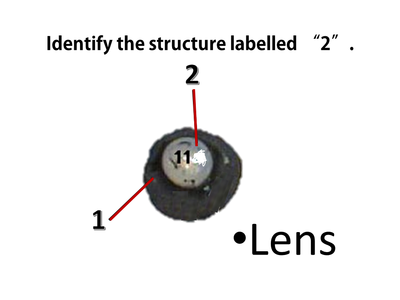 Changing the shape of the lens is necessary to focus images at different distances onto the retina. 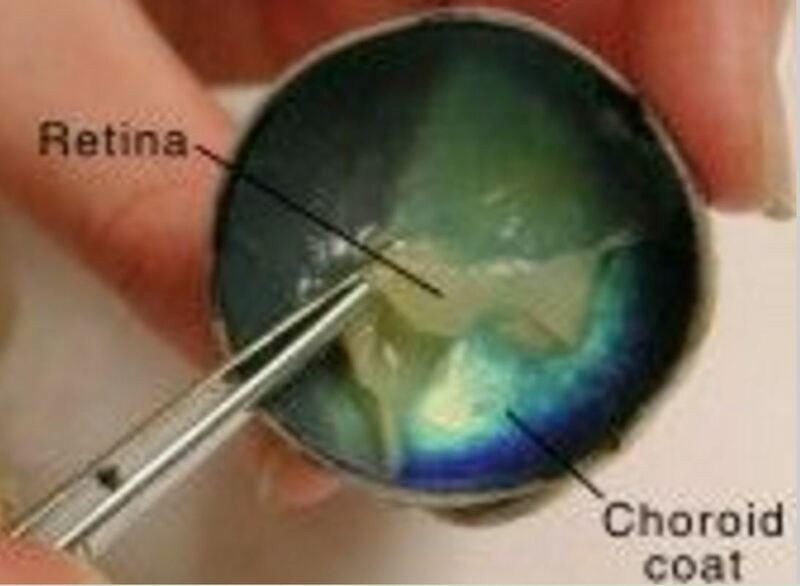 The vitreous humor (sometimes referred to as the vitreous body) is the gelatinous liquid that fills the eye. 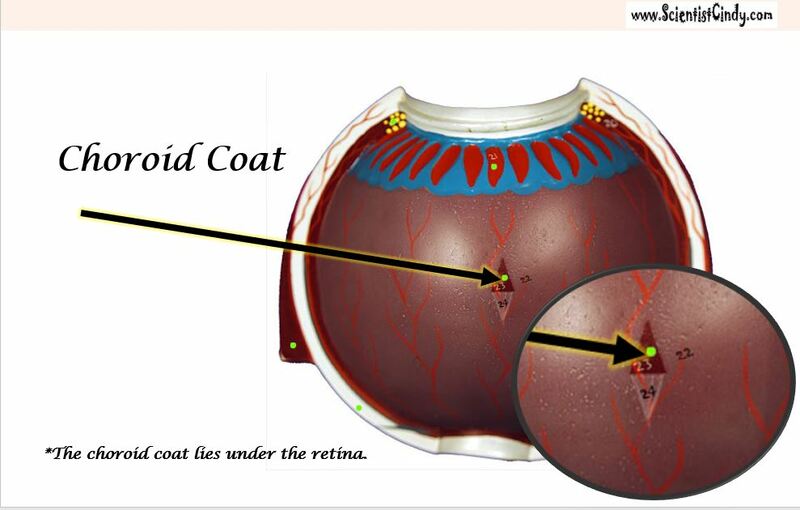 This liquid functions to maintain the pressure of the eye. 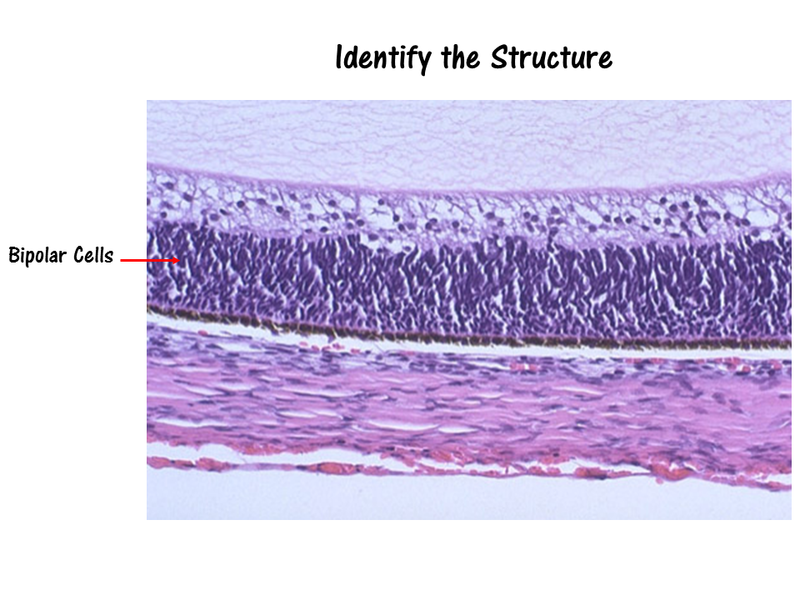 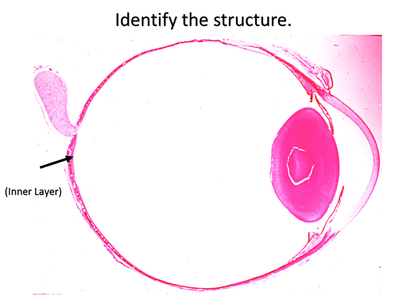 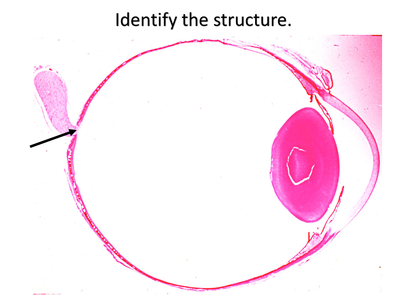 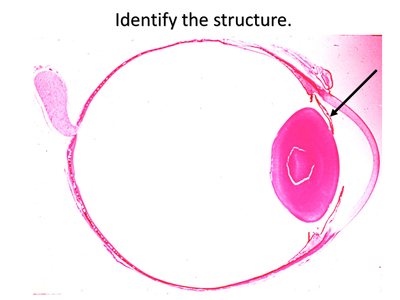 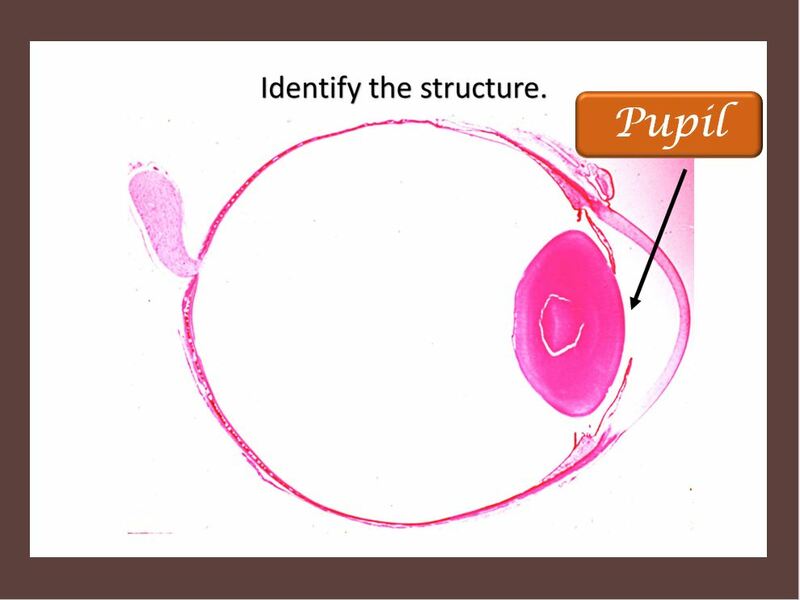 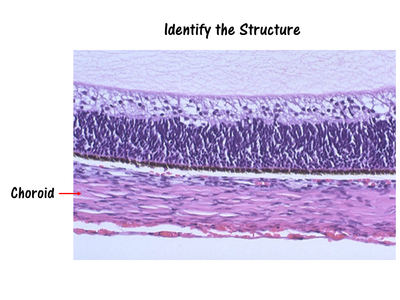 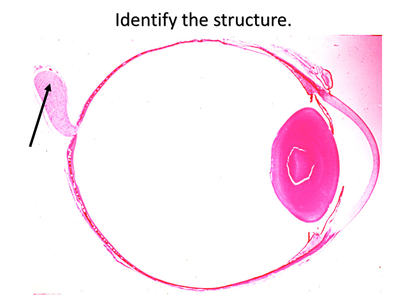 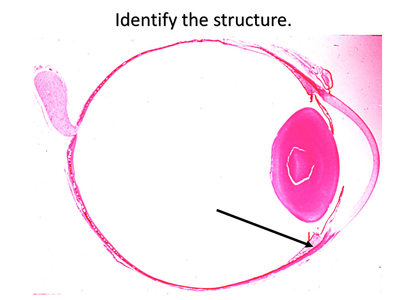 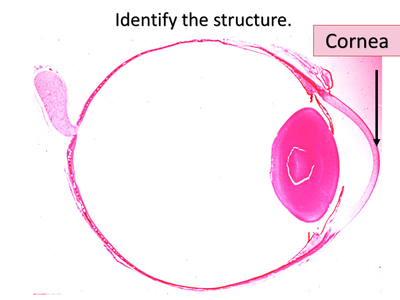 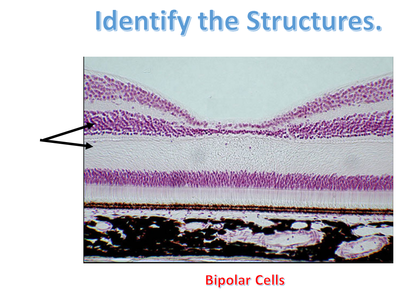 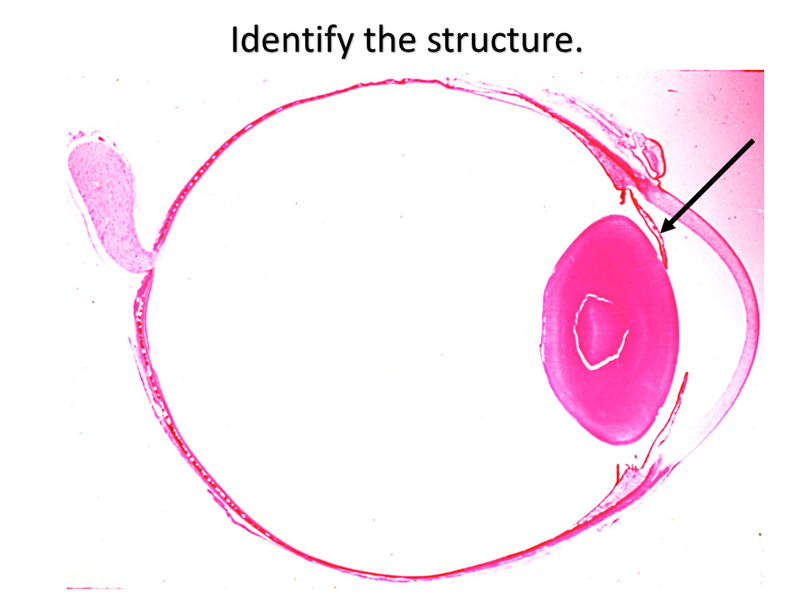 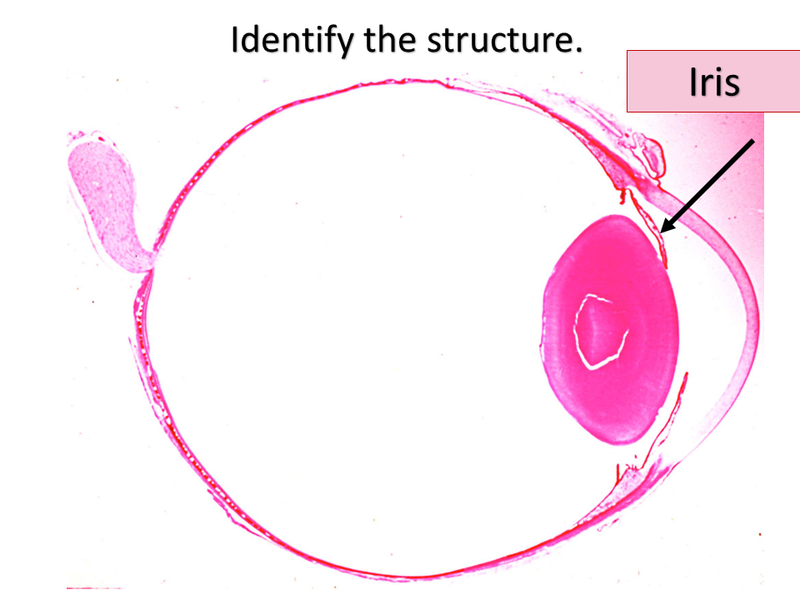 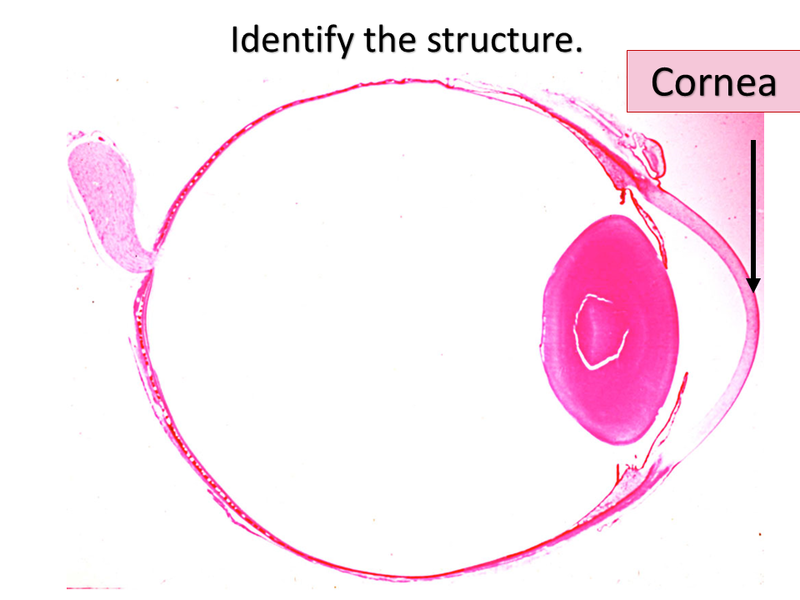 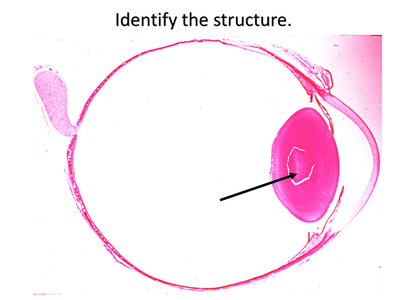 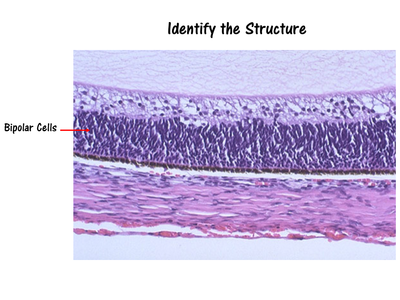 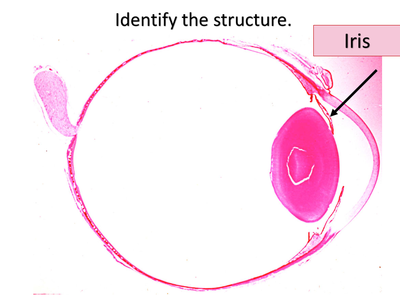 The choroid coat is a highly-vascularized layer of connective tissue that surrounds the eye. 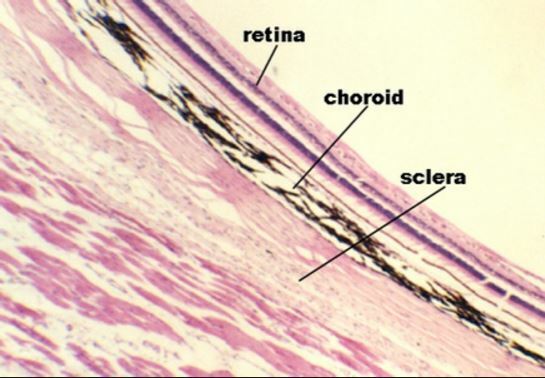 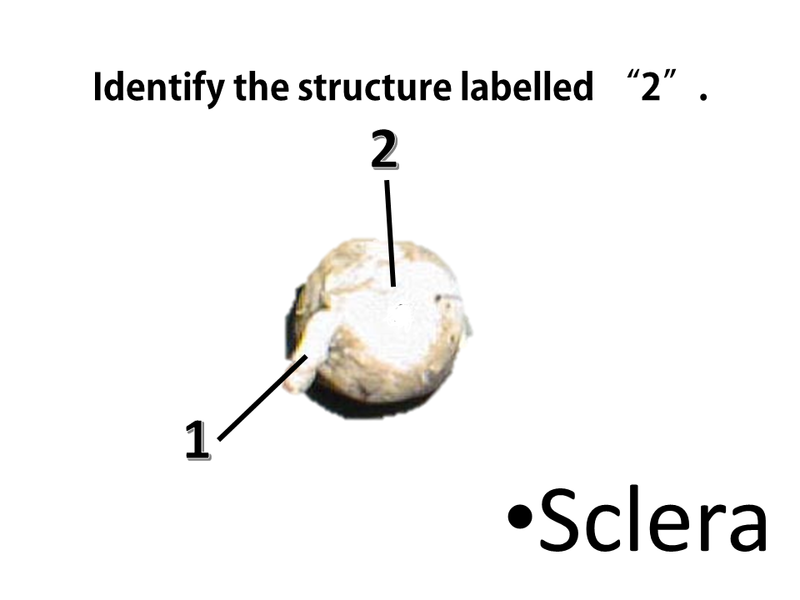 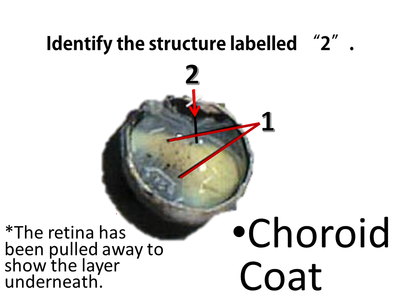 The choroid coat lies between the retina and the sclera. The function of the choroid coat is to provide oxygen and nourishment to the retina. 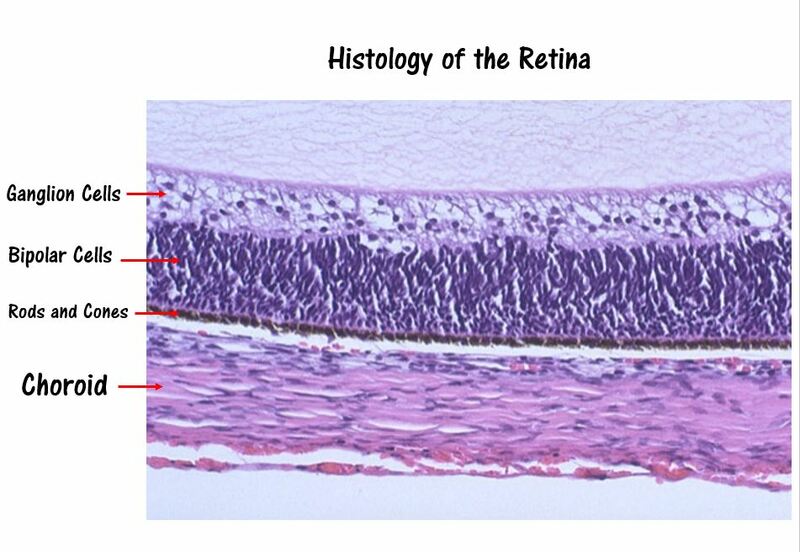 The word 'retina' comes from the Latin word for 'net'. 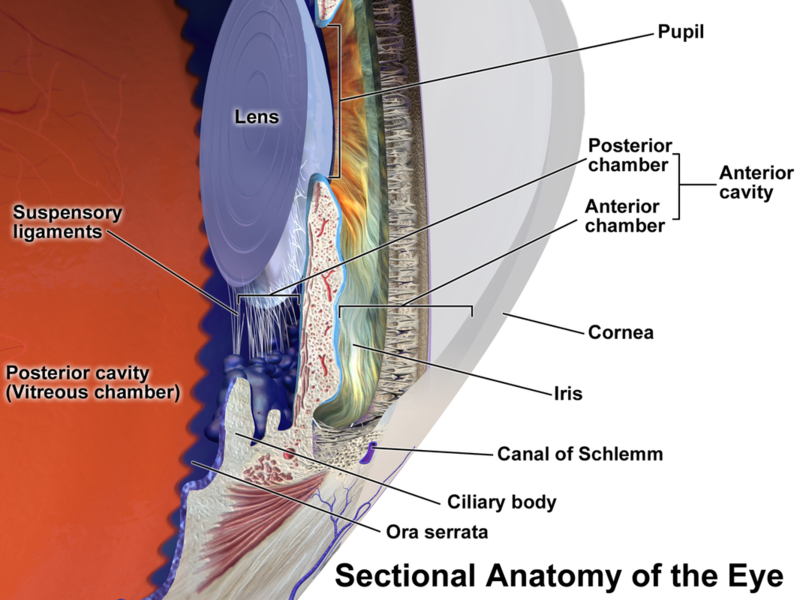 The retina is the innermost layer located at the back of the eye. The function of the retina is to convert visual information into action potentials (nerve impulses) that will travel to the brain via the optic nerve. 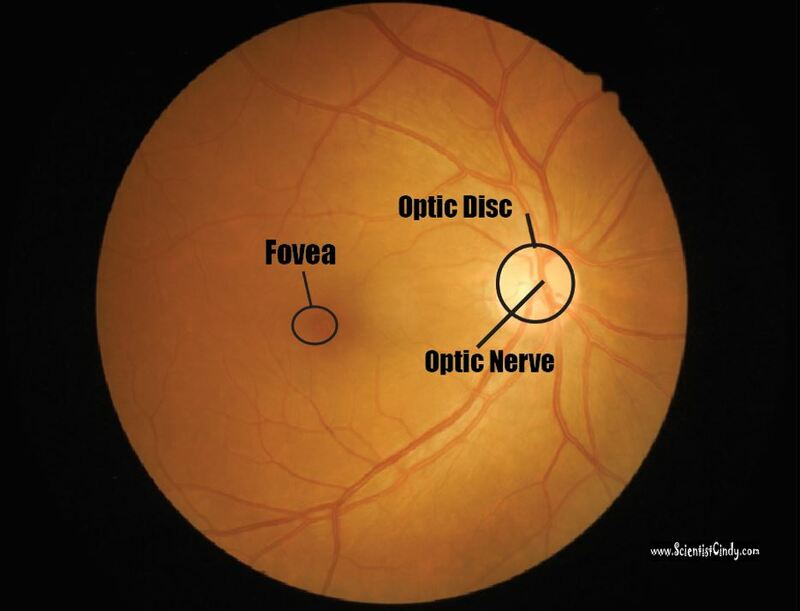 The optic nerve is made up of axons of the ganglion cells that make up the outer layer of the retina. 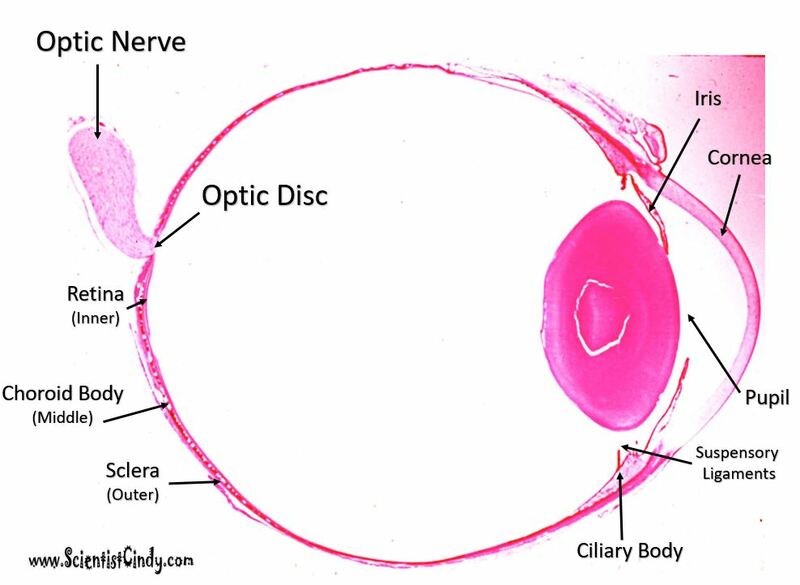 The optic nerve exits the globe (eyeball) at the optic disc which forms a blind spot. The retina contains light-sensitive (photo-sensitive) cells (called photoreceptors) that fire action potentials in response to changes in visual information (in the form of electromagnetic waves of the visible spectrum). There are two types of photoreceptors; rods and cones. Rods are photo receptors that respond to levels of light (shades of black and white) and do not process any color information. The rods make up the major portion of your peripheral vision and are very useful in low-light situations, such as driving at night. Your cones, however are able to process color information. 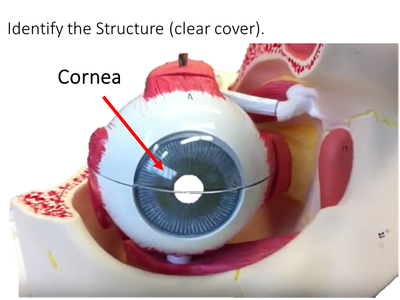 Cones dominate the central portion of your vision which focuses on the fovea. You have 3 types of cones, each specializing in either the RED, GREEN or BLUE, electromagnetic waves of the visible spectrum. The combination of stimulation of these 3 cone types are able to give you all of the colors you see! 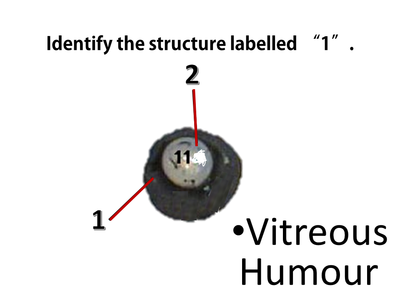 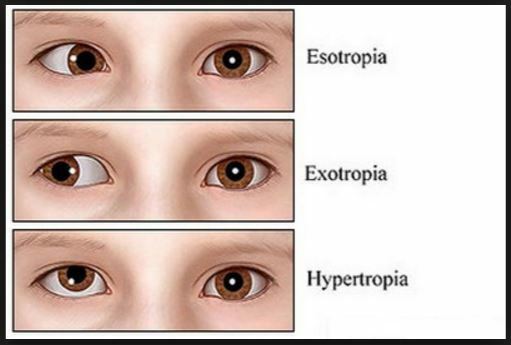 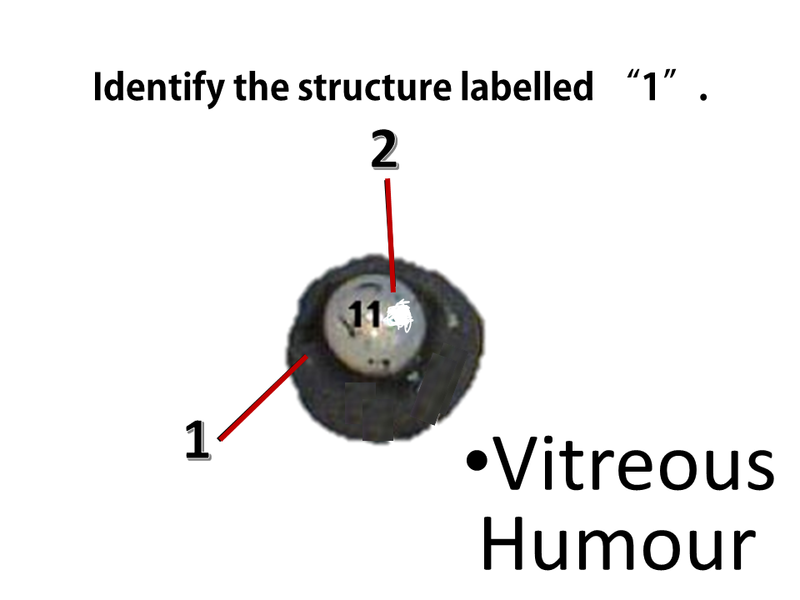 The posterior segment of the eye includes the vitreous humor (vitreous body), the choroid and the retina. The center of your field of vision is the most clear. 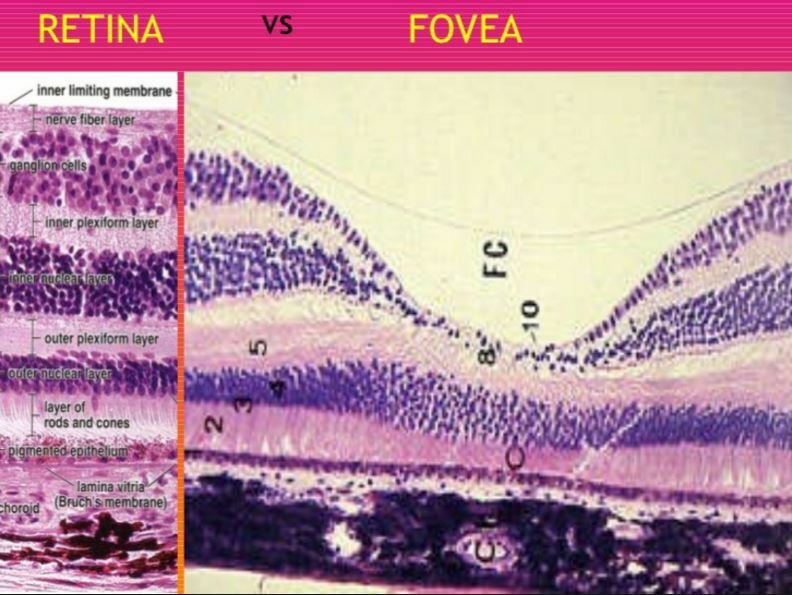 This is due to a part of the retina called the Fovea Centralis (which lies within a slightly larger region called the Macula Lutea)The Fovea Centralis has the highest concentration of cones (cells that code for colored vision) than anywhere else in the retina. 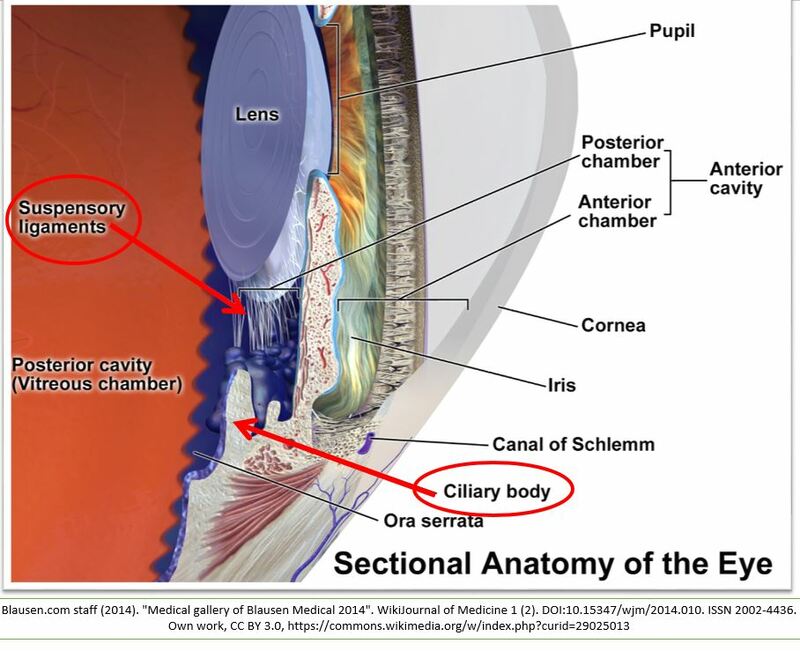 The visual information is gathered by the photoreceptors (the sensory cells of the retina), and processed and sent through the layers of the retina. The outermost part of the retina is made up of ganglion cells. The axons of the ganglion cells make up the optic nerve. The optic nerve functions to send the visual sensory information from the retina to the brain. The point at which the axons of the ganglion cells leave the eye to form the optic nerve, is called the Optic Disc. 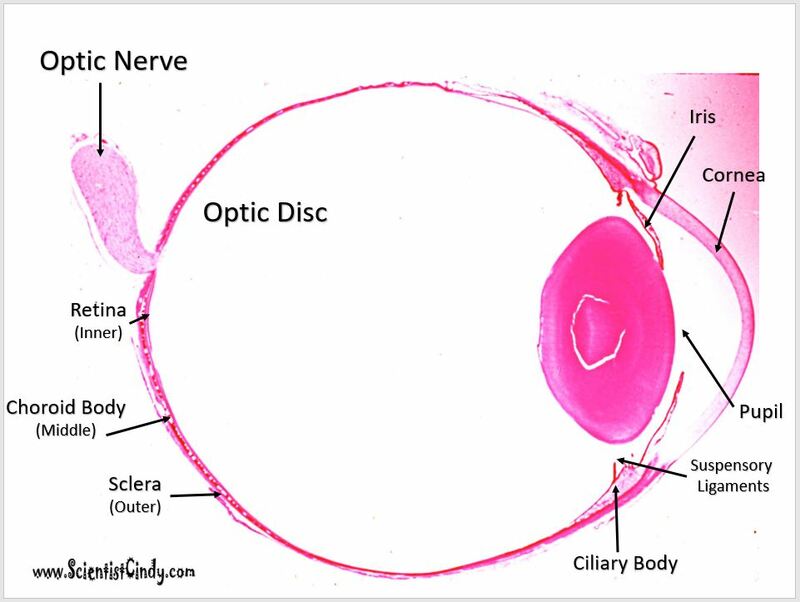 The Optic Disc is essentially a pathway from the eye to the brain. This pathway is devoid of photoreceptors and creates a small "blind spot" in our visual field that we are normally completely unaware of! Superior and Inferior Rectus Muscles. 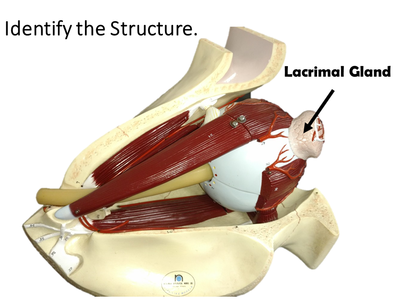 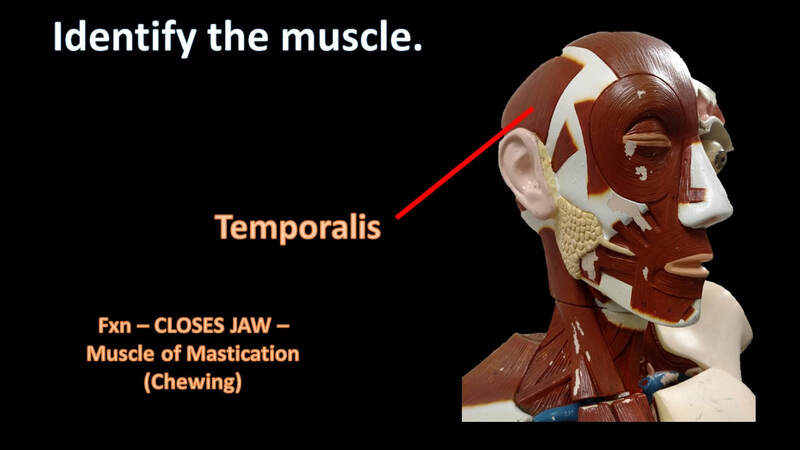 Lateral and Medial Rectus Muscles. 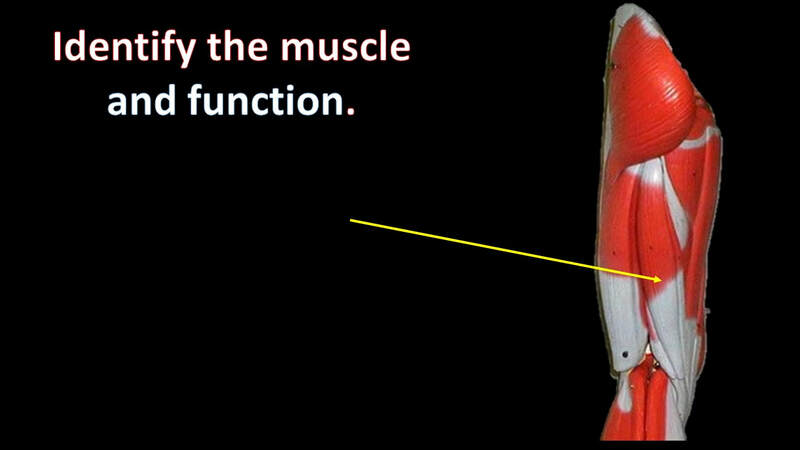 Superior and Inferior Oblique Muscle. 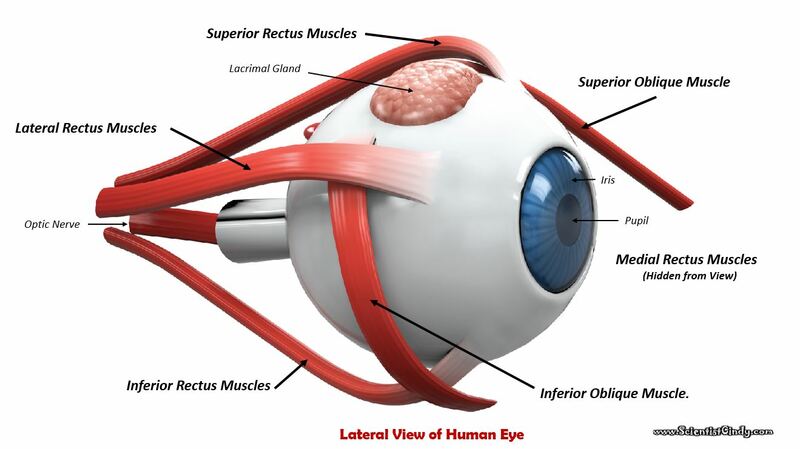 The function of the rectus muscles of the eye allow the eye to look up, down, left and right. The superior and inferior oblique muscles function to rotate the eyeball clock-wise and counter clock-wise to keep the eye from rotating when the rectus muscles are engaged. The Superior Rectus muscles of the eyeball allow you to look UPWARDS! The Lateral and Medial Rectus Muscles of the eyeball work in opposite ways to allow to you to look outward with one eye, while you look inward with the other eye. 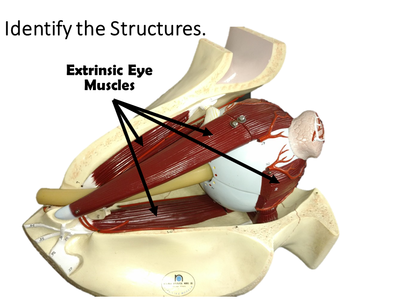 The Inferior Rectus Muscles of the eyeball allow you to look DOWNWARD! 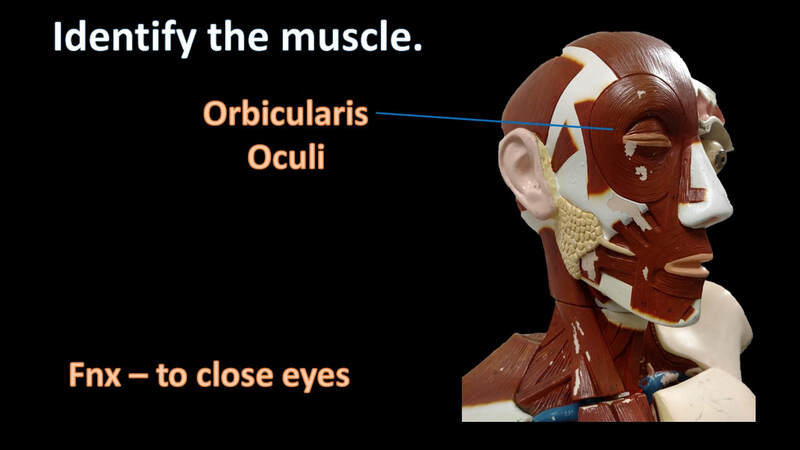 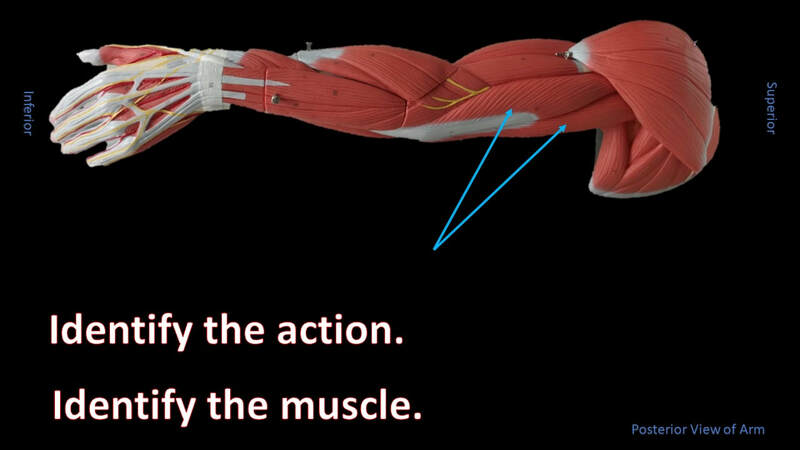 When muscles do not antagonize each other properly, the movement of the eyes are uncoordinated. 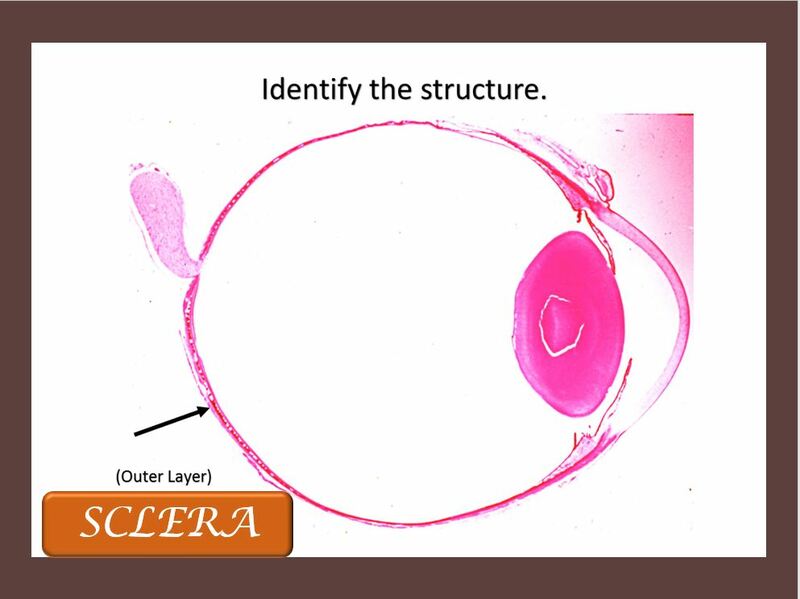 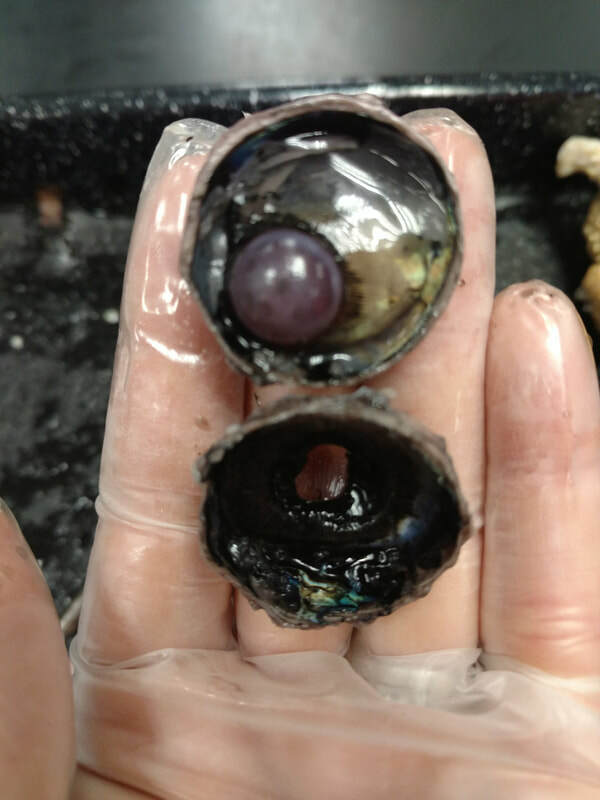 The outer layers of the eye. 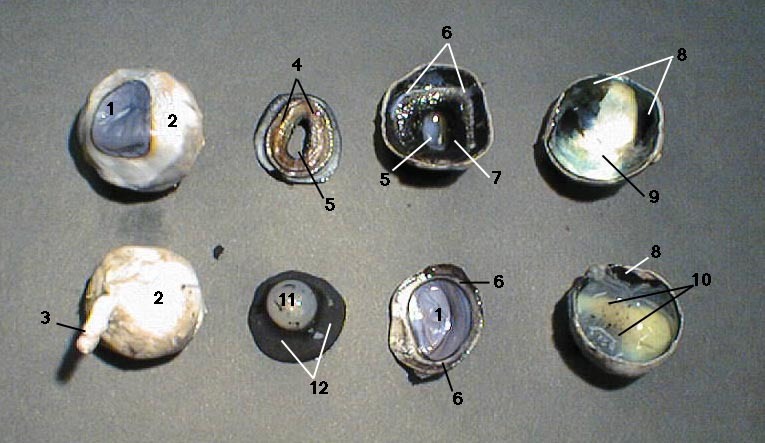 STEP 1) Obtain sheep eye, goggles, forceps, gloves, scalpel and dissecting pan. 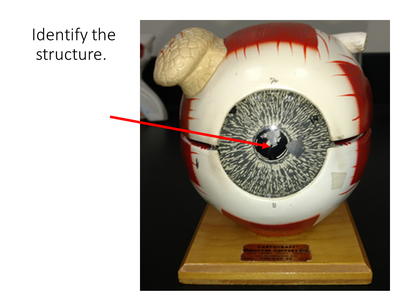 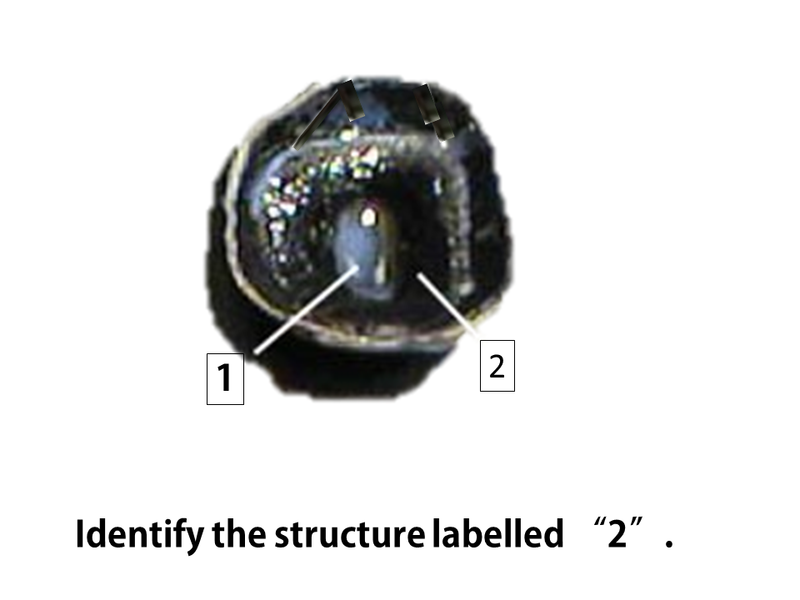 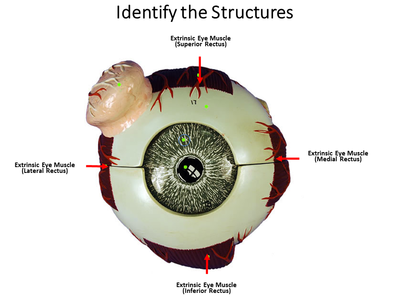 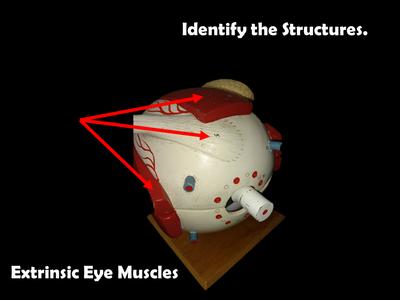 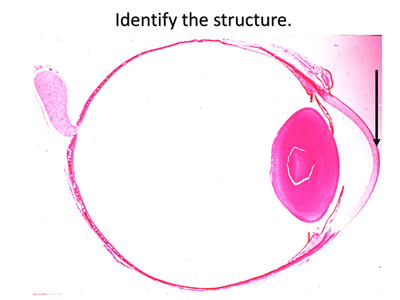 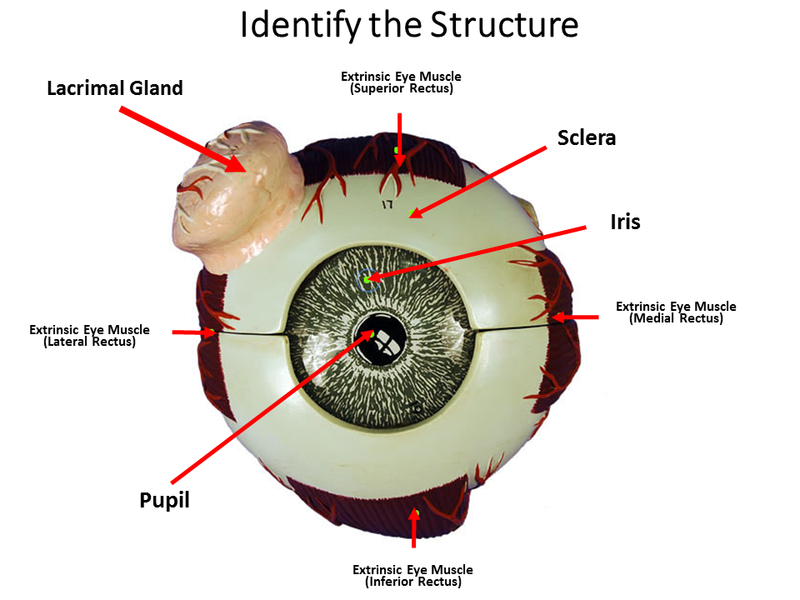 ​STEP 2) Examine and identify the external anatomical features of the eye. STEP 3) Carefully cut the eye on the coronal plane, as shown. 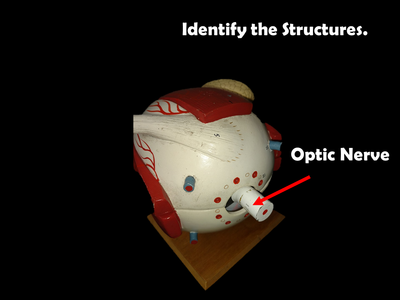 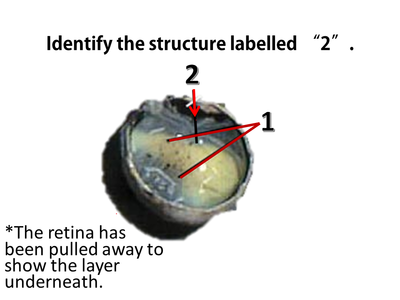 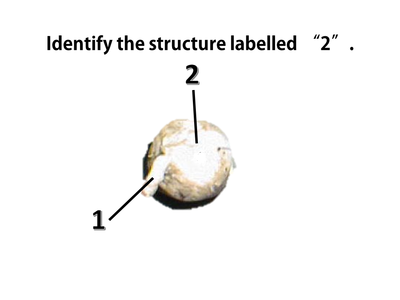 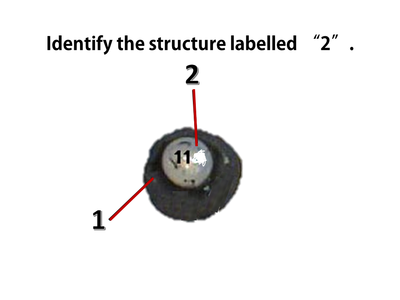 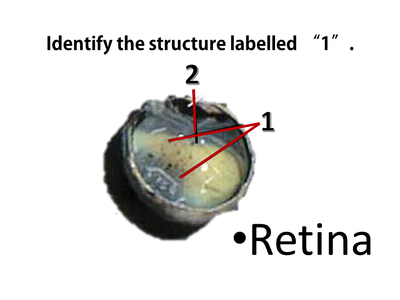 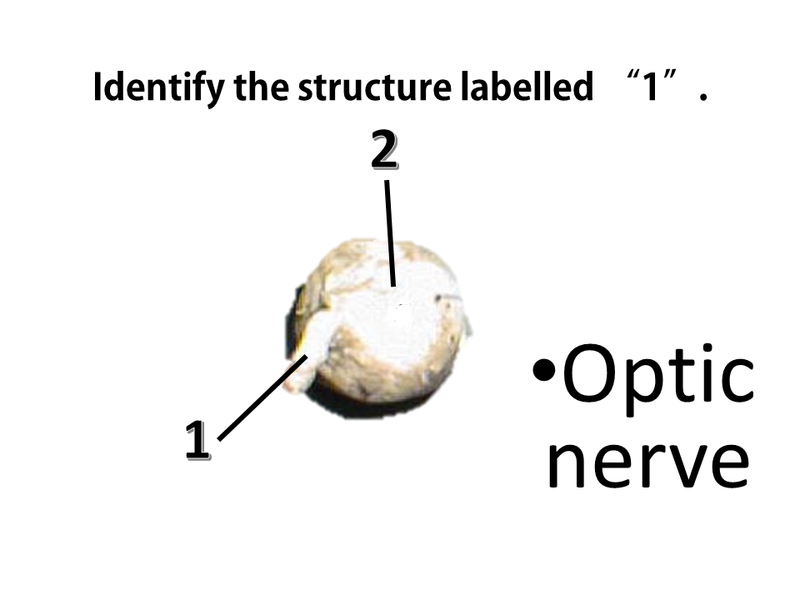 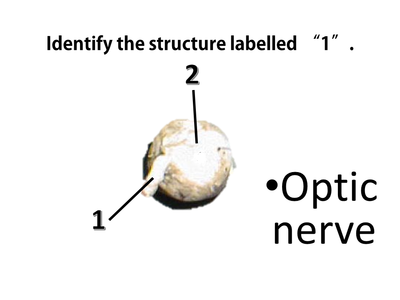 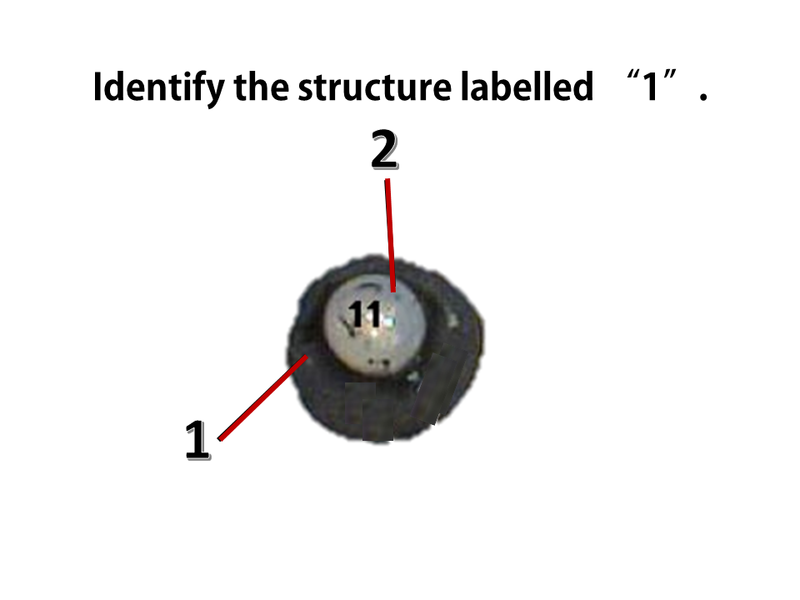 STEP 4) Locate and Identify the key internal anatomical features of the eye. 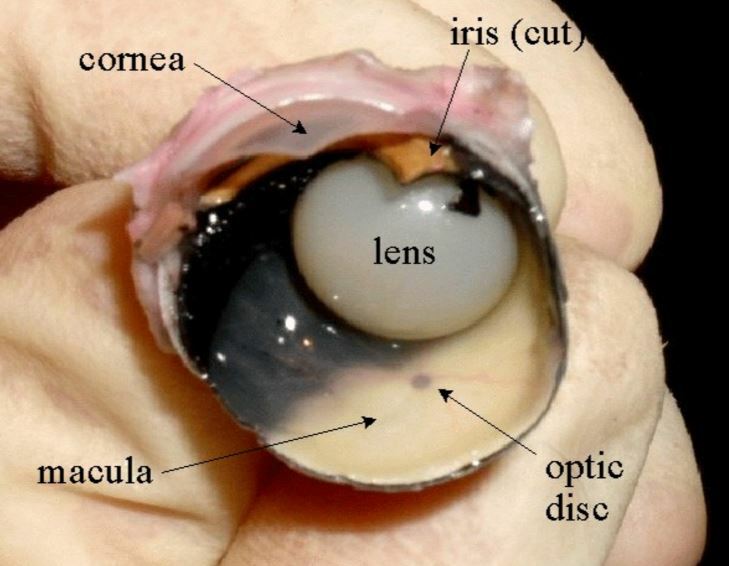 The gelatinous substance that is inside the eye is the vitreous humour. The retina lies at the posterior portion of the eye and appears cream-colored. 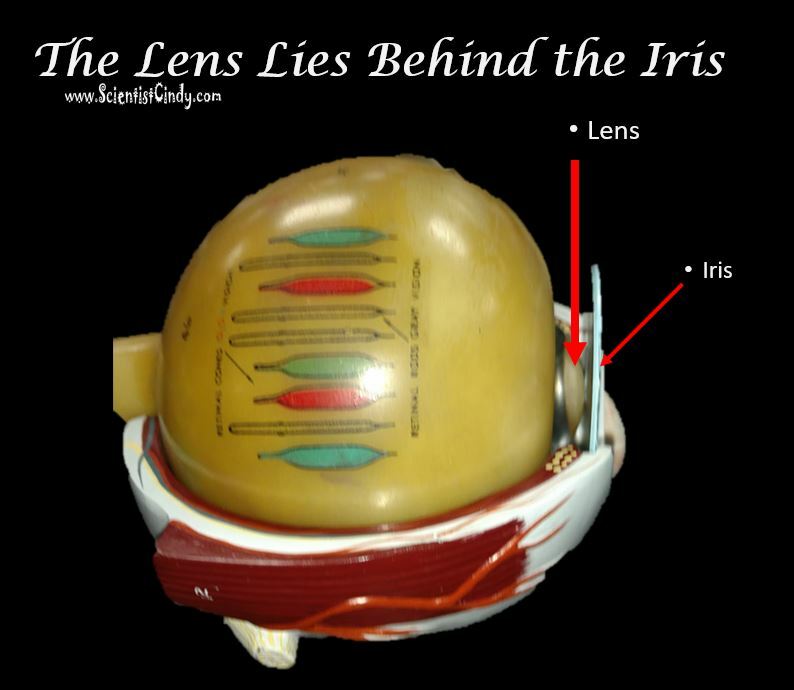 The lens is clear and lies behind the cornea, iris and pupil. Its shape is controlled by the muscles of the ciliary body and is connected to the lens via suspensory ligaments. The optic disc is the point at which the optic nerve leaves the eye. 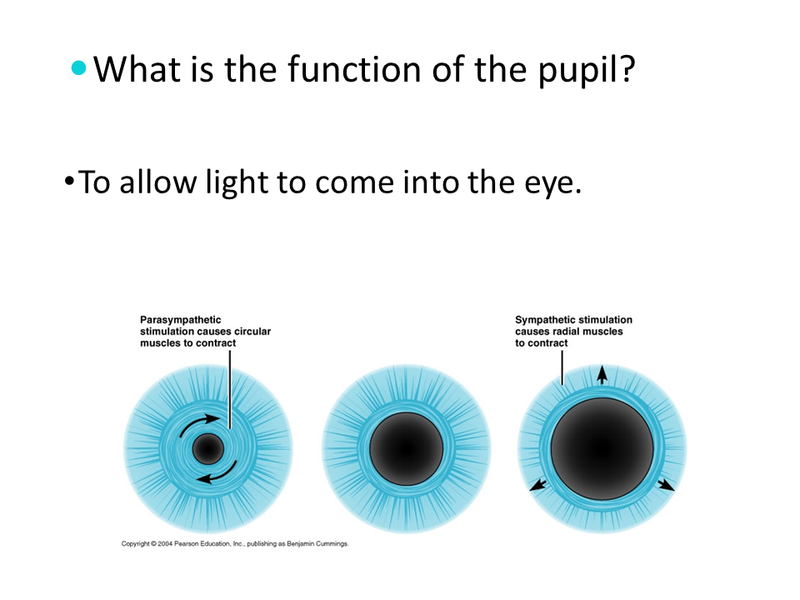 This is also your 'blind spot'. The macula (or fovea) is the point on the retina in which the center of the animal's field of view will be. This area has a higher concentration of cones which allows for greater visual detail to be obtained.